The 95th running of the Pikes Peak International Hill Climb brought together almost 80 competitors for the year’s most exciting hill climb race. Spread over eleven divisions that included both gas and electric drivetrains, some of motorsport’s fastest cars and motorcycles raced up the iconic hill in Colorado in search of new world records. Unfortunately, no record was beaten this year — the fastest car was even slower than last year’s winner — but the 2017 Pikes Peak was spectacular nonetheless. This year’s event gathered 78 vehicles at the starting line, but only 66 made it to the peak to take the checkered flag. A norm for the winner in recent years, the 10-minute benchmark was broken for the sixth time, but no car managed to get below the nine-minute mark. However, this year’s winner set the third-quickest time on the 12.42-mile lap, an impressive time despite being nearly a minute slower than Sebastien Loeb’s all-time record from 2013. In all, five cars and two motorcycles completed the race in less than 10 minutes. Frenchman Romain Dumas is quite the legend in today’s motorsport scene. Having run each and every 24 Hours of Le Mans race since 2001 and every FIA World Endurance Championship since 2012, Dumas has now become the third-most successful Pikes Peak driver after Rod Millen and Nobuhiro Tajima. Driving an updated verision of the Norma M20 RD, the French driver won the race quite comfortably, crossing the finish line no fewer than 28 seconds ahead of Peter Cunningham and his Acura TLX GT. His winning time: 9:05.672 seconds. 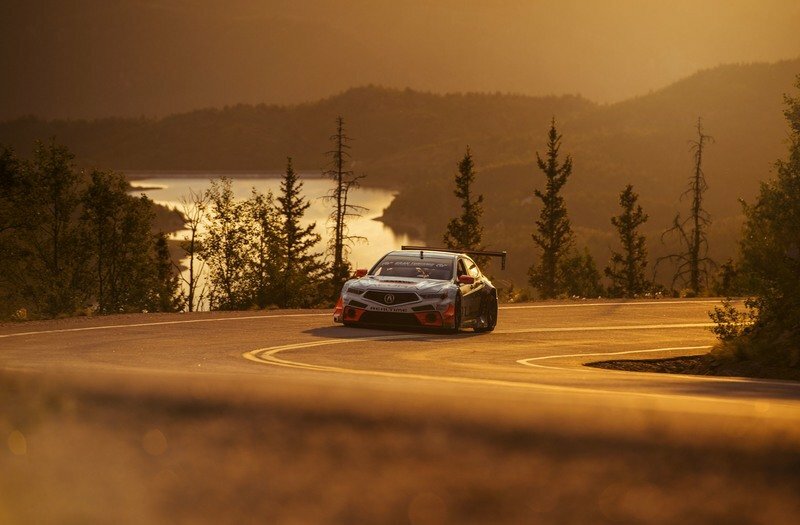 The French driver won the race quite comfortably, crossing the finish line no fewer than 28 seconds ahead of Peter Cunningham and his Acura TLX GT. Dumas’ benchmark is a bit of disappointment though. After winning last year’s race with a 8:51.445 run, Dumas was obviously hoping for a better result, or at least a sub-nine-minute climb. Also, he was nowhere near to breaking Sebastien Loeb’s incredible record of 8:13.878 minutes, which stands since 2013 and seems unbeatable. But Dumas has plenty of reasons to celebrate. On top of winning his third Pikes Peak race in four years, he also set the track’s third-fastest time ever. All told, three out of the four fastest times up the hill belong to Romain Dumas, and all were set with the Norma M20 RD open-wheeler. There weren’t many surprises in this year’s race, especially at the top. The drivers credited with the biggest chances at winning their classes got the job done without major issues. Peter Cunningham won the Open category with the Acura TLX GT, coming in second overall with a track time of 9:33.797 minutes. Third place went to Clint Vahsholtz, who won the Open Wheel class with a Ford single-seater in 9:35.747. Veteran Rhys Millen came in first in Time Attack1 and fourth overall, climbing up the mountain in a solid 9:47.417 minutes in his modified Hyundai Genesis Coupe. Only two seconds behind came Chris Filmore, this time in the Heavyweight Motorcycle division, riding a KTM Super Duke 1290R. Just a hair behind Fillmore was David Donohue, second in Time Attack1 class in a Porsche 911 Turbo S. Although Unlimited class cars are usually considered the quickest, the second and third entries came in only 13th and 14th overall, more than a full minute behind Romain Dumas.